Click here to go to our mixer page. The word balun is a portmanteau! Here's a link to a contributed page where a broken mixer is pulled apart, and a very scary balun is revealed... you'll have to click into a few pages to see it! Below is a simple transmission line balun, modeled in Agilent's ADS. The unbalanced input is port 1, and ports 2 and 3 together form the balanced port. The "CLIN" transmission line is the actual balun, it ideally has an odd mode impedance (Zo) of 25 ohms and even mode impedance (Ze) of infinity (1000 ohms is close enough to infinity to be ideal in the example). Here we've split the balanced port in half so that we can plot the amplitude characteristics and phase balance. Note that the input port is 50 ohms, and the output (balanced) ports are each 25 ohms. This is equivalent to one fifty-ohm load across the two terminals. 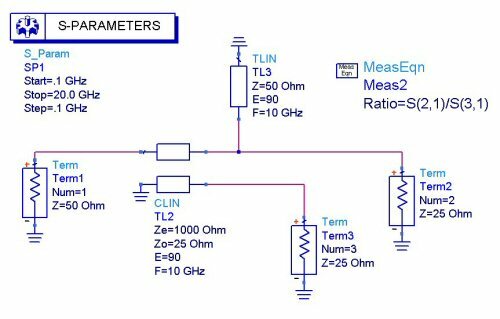 The "MeasEqn" in the schematic provides relative data between the balanced outputs, the ideal phase across ports is 180 degrees. Also note that in the simple balun design, a shorted stub is required to match the circuit (quarterwave at 10 GHz). Below is the response of the ideal balun. You can see that from 2 to 18 GHz, you get a 10 dB input match. 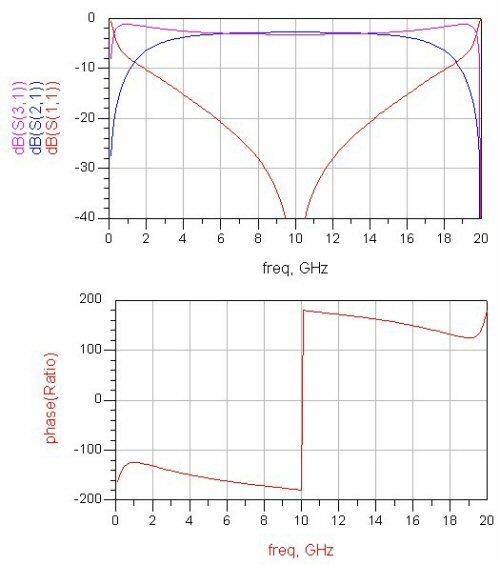 In the phase plot, the ideal 180 phase response occurs at the center frequency (10 GHz). From 2 to 18 GHz the phase error is less than +/- 45 degrees. Such a circuit is what makes 2-18 GHz double-balanced mixers possible. More coming soon, including a physical model of a suspended stripline balun. Click here to search for Baluns on everything RF.